It’s undeniable, for criminal justice scholars and sociologists, that Terry stops are one of the worst things that has ever happened to black America. Stop and frisk policies, along with racial profiling, rose to prominence largely as a part of the 1960s “tough on crime” rhetoric and hysteria. In 1968, the Supreme Court held that, upon reasonable suspicion, the police may detain someone and “lightly frisk” them for weapons if they have reason to believe the suspect is “armed and dangerous.” This vague language, combined with the rampant racism of the late ‘60s and early ‘70s, opened the floodgates for police abuse of black suspects; this time in, it was done in the name of gun control. Since then, these policies have led to stunning rates of arrest and incarceration for people of color. Michelle Alexander, famed criminologist and author, claims that “…In the years since Terry [v. Ohio], stops, interrogations, and searches of ordinary people driving down the street, walking home from the bus stop, or riding the train, have become commonplace — at least for people of color.” For those on the outside of communities of color, this might be hard to believe, but the objective evidence supports Alexander’s claim. In 2013, a federal judge found that the NYPD was using Terry stops with too much regard for race and too little regard for reasonable suspicion. Yes, you read that correctly. In 2013. From the late 1960s to 2013 (almost 50 years later), Terry stops have had a massive, racially disproportionate impact — it’s estimated that blacks and Latinos represent more than 85% of people stopped by the police nationally. Perhaps Terry stops prevent some crime but, more often than not, they merely provide justification for unwarranted arrest, escalate tensions between racial minorities and law enforcement officers, or allow judges to tack on sentencing enhancements to nonviolent drug crimes. For instance, in my home state of Virginia, possessing a firearm during a drug trafficking crime enhances your sentence by five years at a minimum, in addition to the base sentence for the trafficking crime. If a gun is brandished during a drug deal in Florida, the mandatory minimum is 10 years. Gun control was — and is still — used as a justification for tacking on insane sentencing enhancements. Those who oppose the Second Amendment should be worried about police abuse of power in the name of gun control — we’ve had 50 years of it, after all. Renowned scholar Ta-Nehisi Coates puts it best; “If policing in New York under Giuliani and Bloomberg was crime prevention tainted by racist presumptions, in other areas of the country ostensible crime prevention has mutated into little more than open pillage.” Nationally, if Terry stops had never been permitted, our jails would look vastly different. Our high school graduation rates would look different. Black and Latino men would not be locked up to the same mind-blowing degree and might actually have had a realistic opportunity to prosper in America. But the racist history of gun control isn’t the only way in which restrictions on the right to bear arms create inequity and put marginalized people at risk; it’s important to remember that gun use can be offensive or defensive. Guns can play a legitimate protective role in cases when the police can’t be trusted to arbitrate disputes. In many poor, minority communities, people don’t call 911 when things go south. After decades of being targeted by the police, how could you trust agents of the state to act in your best interest? We often pay attention to the cases gone awry, but rarely pay attention to the times that firearms actually play a defensive role and save someone from a gruesome fate. Access to arms grants one the ability to defend oneself or one’s family, to give legitimacy to an uprising or social movement, or to create distance in order to avoid potential conflict. 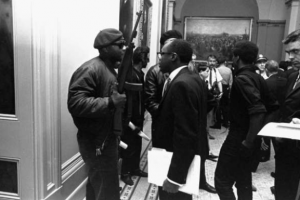 Malcolm X famously claimed that if the government was “…unwilling to protect the lives and property” of African Americans, they ought to defend themselves “by any means necessary.” The Black Panthers heeded his words and took up arms, giving them a violent reputation but also critical political leverage given the challenge they posed to the state’s monopoly on force. 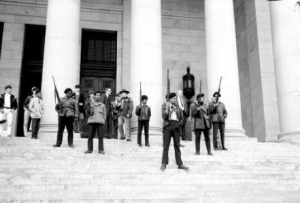 Malcolm X did not tell them to use guns offensively, to go out into the streets and start shooting racist white people — no, Malcolm X made it clear that gun use was their constitutional right and could be a valid form of protection for oppressed minorities. Take caution, though. I would like to think that the deaths of Eric Garner, Sandra Bland, or Freddie Gray could’ve been stopped had they been able to defend themselves, but it’s hard to make the case that the presence of a gun wouldn’t have escalated the situations beyond the point of no return. I’m not convinced that guns are particularly good, but I do believe that giving that level of unmatched power to state agents alone is incredibly dangerous. 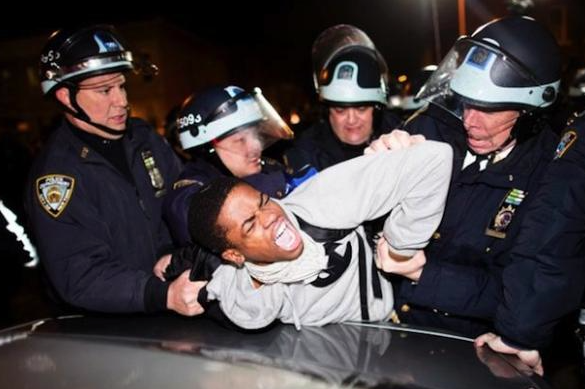 Police violence is already a massive problem — see the stories of boys like Tamir Rice and Michael Brown who were killed so young, and the images of Ferguson and Baltimore preserved in our collective memory. Why would we exacerbate the problem by ensuring that citizens have no legitimate ability to stand up against any threat of violence? Whether it be violence perpetrated by the state, or violence perpetrated by others in neighborhoods where the police can’t be legitimately relied upon — guns, while not unequivocally good or bad, can be important in defending the lives of the oppressed. I’ll leave you with this Malcolm X quote: “If the white man doesn’t want the black man buying rifles and shotguns, then let the government do its job.” So far, government hasn’t done it’s job. We see this in police brutality, in stop and frisk policies, in over-criminalization and in the racial composition of our jails. When government can do its job properly, perhaps we can alter or abolish the Second Amendment — but until then, let’s protect ourselves.